The abundance of housing estates that shot up around London from the late 50s through to the early 70s were often perceived as either a comforting environment in which communities would prosper or, rather more cynically, as grotty quick fix schemes to cheaply house an expanding population. The Market Estate, situated next to Caledonian Road station, is one such complex, and has recently been condemned for demolition. Before the bulldozers move in, a group of artists have been granted the use of the space to do with as they wish. The Market Estate Project acts as an enormous canvas with almost limitless potential for the 76 artists to create unique and fascinating works. Open to the public for one day only on Saturday March 6, the project is a brilliantly executed opportunity to question the aesthetic worth of the estate. From one perspective it’s little more than a concrete playground for local ‘yoofs’ to inspire Daily Mail headlines; an ugly, threatening, crumbling mess distinguished from the junk littered around it only by its familiar structure. However, a great deal of the artwork focuses on bringing out the human element; a celebration of the memories and lives of the people who called this jumble of bricks home. Every square foot trodden by the project twists, turns and plays with the concepts of beauty, humanity and, ultimately, destruction. You must experience the Market Estate Project before it’s completely flattened for redevelopment: get down there or die trying. 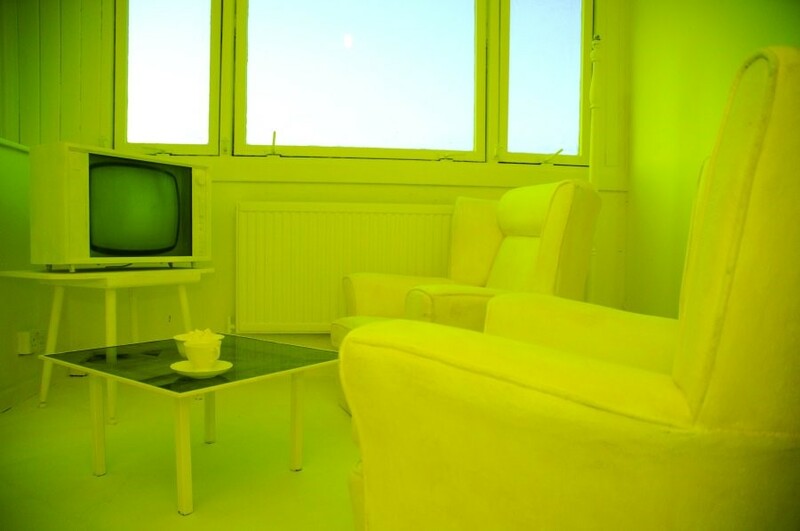 We thought flourescent yellow would be really appropriate to represent this dying utopia. It’s such an antiseptic colour, so there’s a hope to it, but it’s also carcinogenic so it’s like this nuclear hope that also has these elements of failure in it. Then there are more formal aspects: it’s not a one-colour room, because the shadows do different things as the luminous yellow is so reflective. When your eyes adjust after a little while and then you walk out, you can see pinks and blues for a couple of seconds. The furniture was based on looking at pictures of flats from the era it was built and seeing what the interiors looked like. I had an idea to create a sculpture that broke through the space and played with this idea that there’s something latent in the walls; playing around with what lies beyond what you can see. You do get this idea that there’s something coming out of the wall and creating these shapes, but I haven’t depicted a monster or anything. It turned out more violent than I expected. I want it to be quite arresting, which it is. I want it to be quite bold and strong, but I also want people to be intrigued by it. I think there’s a playful element to it as well. Blue is quite a receding colour and red comes forward at you. If the spikes were red then it would be even more violent than it is. With the blue it has a strength, but it doesn’t have the same connotations of blood. The piece is an installation and performance. It’s a transformation from one state to the other. The shape of the design I have painted is of plants; I got the inspiration from the tree outside that I could see through the window. For the performance I will delete my work by painting over it. It is about nothing. It is about life and this image coming up on the white wall then going back to the white wall, following to the fate of Universe. Photography: Rob Baker Ashton. The Market Estate Project is open for public view on March 6 from 2pm – 10pm.